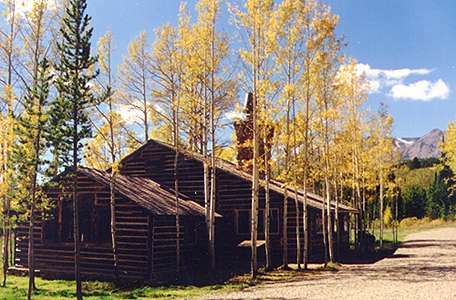 The Lodge is surrounded on three sides by an aspen grove (and by Routt National Forest), with a commanding view. The Willow Creek Range (continental divide) is 35 miles to the south, and The Medicine Bow Range is 30 miles southeast. 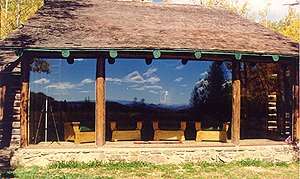 Immediately to the west in the Forest is an intimate view of the Park Range, which is also the Continental Divide. Crowds and traffic are not a problem. The ranch and forest are rich in elk, deer, antelope, coyotes, beaver and moose, as well as the occasional bear and mountain lion. And lots of coyotes. Mud room for your waders and equipment. 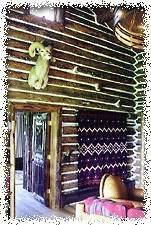 The structure is original, constructed with lodgepole pine logs from the ranch and native stone. 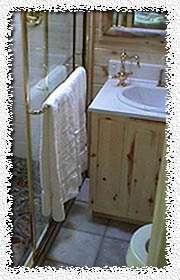 We've retained the original decorative slabwork on doors and windows. We've added a solid foundation, a photovoltaic electrical system, baseboard heating, a sweetwater well and plumbing, hardwood floors and opened up the dramatic view. 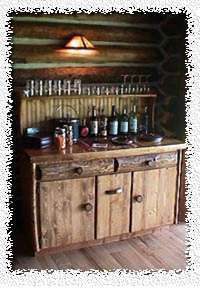 Furnishings were constructed to our specifications by regional craftsmen, largely from lodgepole and other native woods. Your party of four will be cared for by a staff of two: A flyfishing guide, experienced in our waters, and a talented chef to prepare memorable food. 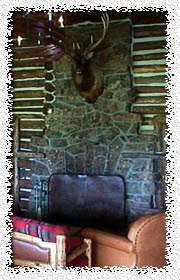 The Old Boettcher Lodge will become your party's private luxury retreat in the Rockies during your week with us. Fine meals are a high point of the day. We feature perfectly-aged beef, wild elk, buffalo and other game, as available, with good wines chosen to complement the selection. If you have special food desires, we'll try to accommodate your wishes. Meal schedules are at your preference. We ask all guests to complete a profile upon reservation, so that we can best provision the Lodge prior to your arrival. Guest's comments on the food have been extremely favorable. Our location is in the mountains, but our hospitality is in the Southern tradition. Nighttime entertainment includes a lot of silence, a billion stars, singing coyotes, bugling elk, rushing waters, music, our library, our open bar, conversation, anecdotes, fibs, anything that can be done with a deck of cards, philosophical and practical discussions, chess and checkers, fly tying, tending the fireplace, and more conversation. We guarantee there's no television. If you don't bring one, there's no phone, either.